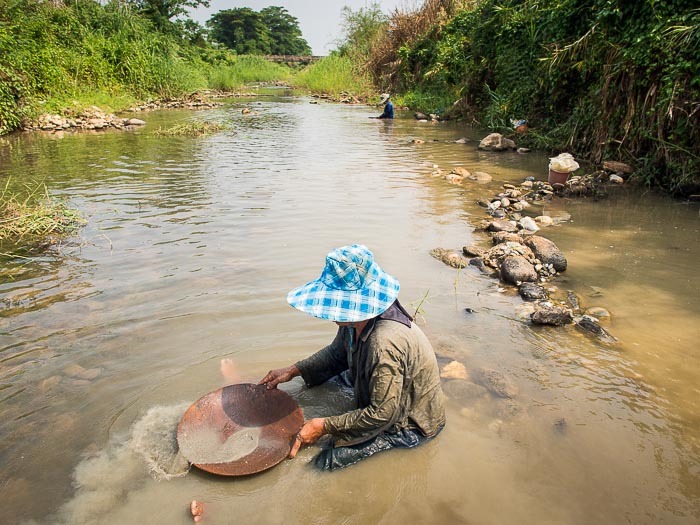 A woman pans in the Mae Wang, (Wang River) near Wang Nua district in Lampang. 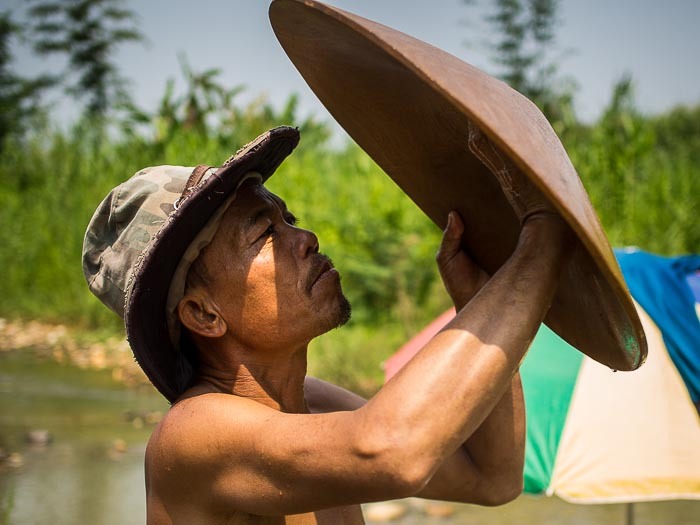 When the level of the Mae Wang (Wang River) drops, in February or March, the farmers hoping to strike it rich scour the river bottom for tiny flecks of gold. People have long suspected that there was gold in the area but no one really knew how much or where. In 2011, a construction crew digging sand out of the river bed opened a vein of the precious metal. The project is complete but the seasonal miners are still working the river bed looking for gold. 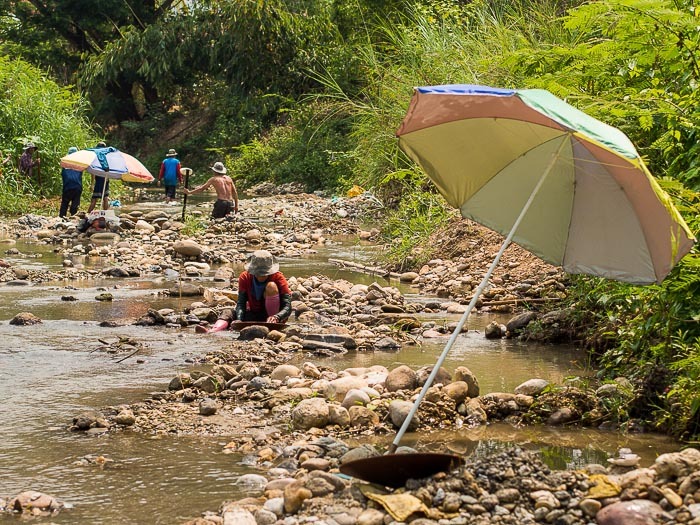 The Thai government commissioned a survey of the river after the discovery of the gold. The survey found there was a "fair amount" of gold ore in the river, but not enough to make it commercially exploitable. So the farmers have the river to themselves. Artisinal gold mines line the river. Farmers have their "stakes" outlined in rock. They start looking for the gold in the dry season as soon as the river level drops (river levels here fluctuate based on the season). They start about 9AM and work through the day until 4PM. Every day. They dig up loose gravel and swirl it in wooden pans, gently washing the dirt and sediment out until only gold, or so they hope, is left. This year they may be able to work a little longer because the government is predicting a drought that could delay the rainy season. The truth is there isn't much gold. Most farmers find a few flecks of gold dust in the course of the day. They hope to make enough to help their families through the dry season. In a good month, they can make between $65 and $100, a substantial amount of money to a person who makes less than $3 per day. 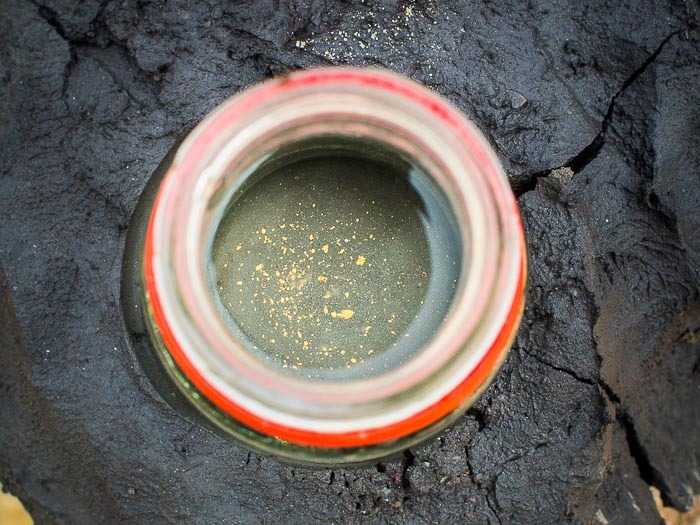 Flecks of gold in a miner's jar. A miner checks the bottom of his pan for gold dust. The government allows the miners to work the river bottom as long as they work on public lands. They aren't allowed to work in the national parks in the area. The miners also regulate themselves. They work their "claims" and each claim is outlined in river rock. They dig up gravel and sediment from their claim and then rinse out their pans in a shallows near their claim. These are not elaborate underground mines, but it's no less back breaking. Miners spend all day under a grueling sun, daily highs approach 38C (100F) with humidity in the 70%-80% range. March and April are the hottest months of the year in Thailand and they are out in the hottest part of the day. There are more photos of the gold miners in my archive or available from ZUMA Press.